Ancel Melton, assignee of Jesse Brown received a 100 acre Land Grant located on Flag Creek adjoining his own line and Ambrose Brown's improvement. Jesse Brown and Ancel Melton were chain carriers. Nathan Morgan received a 4 acre Land Grant located east of Cabin Creek adjoining his own line. Ansel Melton and James Morgan were chain carriers. Leonard Furr Junior received a 25 acre Land Grant located on Flag Creek adjoining his own line, Ansel Melton and McLeod. Jacob Furr and Danl. McLean were chain carriers. Ancel Melton received a 20 acre Land Grant located on Flag Creek adjoining Neill McLeod and his own line. William Williams and Isaac Cagle were chain carriers. Leonard Furr received a 44 acre Land Grant located on Flag Creek adjoining his own line, Neil McLeod, Ansel Melton, Laky, and William Jones. Ansel Melton and Isaah Melton were chain carriers. Ansel Melton received a 100 acre Land Grant located on Buffalo Creek adjoining James Dunlap and McNeill. Ansel Melton, Junr. and James Melton were chain carriers. Estate of Henry Melton, dec'd. by Administrator James Dunlap. Accounts listed for the following: James Dunlap, James Melton [for $6], John Kennedy, Hugh Hammel, John Williams, Thomas Williams [short], and Robt. Melton [for wheat and smith work]. Notes due on the following: James Melton Jur. [for $30], Ansel Melton [for $32], Daniel Mcrimmon, Charles Sowell & James Hains, John Williams, Jesse Brown Jr., Robert Melton Sr.[son of Ansel] - for $1.75 & $11.90], William Cagle and David Jones. Items were purchased by the following: James Dunlap, Thos. Williams [of Chris], Sarah Melton, Jesse Brown Sr., Robartis Huzza, William Brown/Brewer, Robt. Melton Sr., Ansel Melton Jr., Jno. Wallis, John McDaniel, James Muse, Edward Moore, Daniel McCrimmon, William Williamson, Isaac Brown, Isaah Melton, George Adams, Robert Melton Jr., Matthew Williams, David Jones, Jesse F. Muse, Norman McLoud, and George Hunsucker. Ansel Melton was born in Moore County, North Carolina in 1773 and died between 1850 and 1860 in St. Clair County, Alabama. Ansel Melton was the son of James Melton of Orange County, North Carolina. 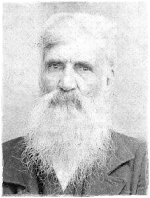 "Ansel Melton, the great grandfather of W.F. Melton, married a Miss Brown from Ireland and raised his family in Moore County, N. C. (The Meltons were originally Irish.) There were five boys: Jesse, William, Isaiah, Robert and John. Jesse moved to Western Kentucky about 1835. William, then a young man, went with him, but later in life moved to St. Clair County, Ala.
"Isaiah lived and died in Moore County, N.C.
"Robert moved to Itawamba County, Miss. about 1845. John went from Moore County, N.C. to St. Clair County in 1833. In 1835 he was married to Mary Sewell in Gainesville, Hall County, Ga. He remained there two years and moved to St. Clair Co., Ala.
"There were three daughters of Ansel Melton. "The youngest Millie never married. "The oldest married a Mr. Dunn and moved to Ark. early in the 80s. "The name of the middle daughter is not remembered." Wightman Fletcher Melton, then President of Florida Conference College, wrote a novel The Preacher's Son, Publishing House of the Methodist Episcopal Church South, 1894. He wrote on Page 21 of an "Ansel" who moved from South Carolina to Cherokee County, Alabama, about 1830. He said this Ansel was a hatter by trade and also a local Methodist preacher. A character in the book says of Ansel, "Of course I remember him. I can almost see him now driving into Spartanburg with his little cart loaded with hats of all shapes and sizes." The author, Wightman Fletcher Melton, told members of his family that although the book was fiction, the part about Ansel was true fact taken from Ansel's life and that Ansel was the author's great grandfather. Among those he told this was his grandson, Oliver Quimby Melton, Jr. (1922--). An undated note from Oliver Quimby Melton, Sr. (1890-1977), who was the son of Wightman Fletcher Melton, to Oliver Quimby Melton, Jr. (1922-- ). says, "Ansel Melton, between the time he lived in South Carolina and moved to Cherokee County, Alabama, lived for awhile in North Georgia at a place known as Big Springs--this is somewhere east of Calhoun, Ga."
References: 1850 Federal Census of St. Clair County, Alabama, Page 147B. The Melton Ledger by Wightman Fletcher Melton, Page 1. Undated note from Oliver Quimby Melton, Senior, to Oliver Quimby Melton, Jr.